Create this amazing candy cane mud pie for your next holiday celebration. This weekend is our annual family Christmas party and I am serving this amazing peppermint candy cane ice cream pie. This candy cane mud pie looks difficult, but it’s quite easy to make. The biggest challenge is getting the candy canes to stand up around the edge of the pie. I took spoonfuls of the softened ice cream to help hold them in place. How how neat does that candy cane edge look? If you’ve followed my blog for very long, you know that I like really yummy food that is simple to make. This ice cream pie is no exception. You only need five easy ingredients and a spring form pan: chocolate sandwich cookies, butter, hot fudge sauce, candy cane ice cream, and mini candy canes. Crush the sandwich cookies and mix them with the melted butter. Press that mixture into the bottom of a spring form pan to form the bottom crust. The fudge pairs well with the mint of the candy canes. Place some of the ice cream on top of the fudge. As you get toward the edge put the candy canes in place. Put more ice cream in place to hold the candy canes up. Get it into the freezer to harden right away. Make this for your next gathering and impress your guests! I assure you that it will disappear quickly. It’s so fun and festive. The peppermint of the candy canes is a perfect contracts to the chocolate fudge. My family has requested that I make it again for Christmas. How delicious does that look? It’s very rich and yummy! I love the combination of mint and chocolate. 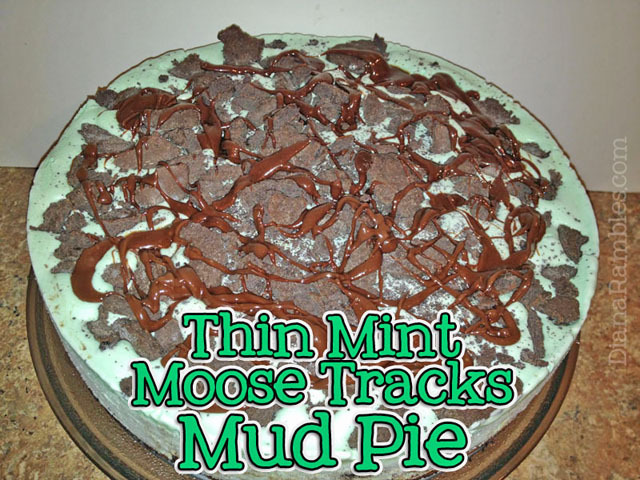 Have you ever made a mud pie? Creating this candy cane mud pie is fun and easy with just 5 ingredients. Set the ice cream container on the counter to soften. Reserve three sandwich cookies and crush the rest. Press the cookie mixture into the bottom of a spring form pan to form a crust. Heat the fudge until it smoother and spread it on top of the crust. Unwrap the small candy canes and press them into the fudgey crust so that they stand up against the outside of the spring form pan. Carefully press the softened ice cream into the pan. I placed it in the middle first and them pushed out against the candy canes. Use the entire container of ice cream. Place whole or crushed sandwich cookies into the center of the pie. Arrange the candy canes around the center cookies. Freeze the pie until hard. Let the pie soften on the counter about 5 minutes before serving. I have never had mud pie before. How am I just hearing about this now? I first heard of mud pie years ago at an upscale steak and seafood restaurant. Not sure why it's not been popular other places. I prefer this to an ice cream cake. Looks so delicious and elegant, yet seems simple enough I could enlist the help of my girls. Perfectly festive for the holiday season as well. Candy canes and chocolate are perfect in a pie. It does help to have extra hands hold the candy canes in place. I bet that does taste good. I love peppermint and chocolate combined. I think it makes for a great pie or cake or drink or anything. Yes! One of my favorite flavor combinations. Oh my goodness, this really takes me back! I haven't had a mud pie since I was a little girl. Yes! Bring back those fond memories. Oh I would absolutely love those flavors, yum! The cake looks pretty and perfect for a party too. I'd have it right in the center of the table for the guests! And it would disappear fast! This candy cane mud pie looks so delicious. I know it will be a big hit with my family. I am always looking for new dessert recipes to try. I will have to make this for a Christmas party we are going to this weekend. They will all be impressed! Oh my this looks amazing. I am excited to get the ingredients I need to make this. I bet it will be a hit. I have never tried candy cane mud pie before. It looks so delicious and easy to make. My kids are going to have fun helping me make some. My daughter helped hold the candy canes in place. Not only does this sound delicious, it is gorgeous! What a pretty dessert! This candy cane mud pie looks SO good! Definitely a holiday must try! It sure tastes like the holidays. OMG these are a few of my absolute favorite things!! Thanks for sharing this recipe, I will have to make it this year! Oh yum! This looks so scrumptious. I love the candy canes. That looks amazing! We are making a similar dessert for Thanksgiving but with different candies and ice cream flavor. Pinned. What flavors do you use? We used Oreo Ice cream and sprinkled the top with bits of Heath bar. Thanks again for sharing with us at the Happy Holidays link party. This post was one of my featured favorites showcased on my blog today! Wow, this looks delicious! I just pinned it. Found you via the Happy Holidays Link party at Our Unschooling Journey.